If current economic growth trends persist, the “great divergence” between Western Europe and East and South Asia in per capita income that commenced 200 years ago will close sometime this century. Key to the closing will be greater accessibility to technology, higher education in East and South Asia, and the relentless diffusion of knowledge including in the biosciences. Advances in the biosciences are poised to contribute in a major way to English economist Thomas Malthus’s four necessities of human life–food, fiber, fuel, and building materials–as well as to human and animal health, biodiversity conservation, and environmental remediation and sustainability. As my coauthor Leo Furcht and I recently wrote in “Divergence, Convergence, and Innovation: East-West Bioscience in an Anxious Age”, 21st century history will describe the great economic and technological convergence between East and West. It will also further entwine the economic and ecological storylines of the human experience as the vast populations of China and India strive to enter the middle class. Environmentally sustainable economic growth will require putting knowledge of life code, cellular processes, biosynthesis, and biological regeneration to practical use. That prospect is at hand because the biosciences are in the midst of their own convergence–with information technology, nanotechnology, microelectronics, materials, artificial intelligence, robotics, architecture, and design. Products arising from molecular biology constitute a growing share of the global economy with each passing year as technologies evolve, production processes improve, and markets expand. 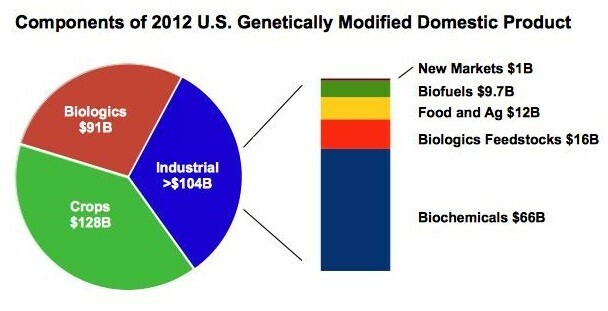 In recent years industrial biotechnology has grown faster than the biologic drugs and agricultural biotech sectors in the U.S.
U.S. biotech revenue in billions of U.S. dollars. Industrial biotechnology employs greener and cleaner technologies to make chemicals, solvents, fuels, and materials such as biocomposites and bioplastics. Growth in this sector can weaken the link between economic growth, environmental pollution, and greenhouse gas emissions. Genomics, synthetic biology and metabolic engineering are poised to accelerate growth in the design and manufacture of industrial enzymes and renewable bio-based products. East and South Asian production and consumption of industrial enzymes are on the rise as the Asian middle class expands. Bioscience is enabling major cereal crops such as wheat, rice, and corn to adapt to a changing climate. Cereal crop yields need to grow by an estimated 70 percent by mid-century to feed the projected nine billion people expected to then inhabit our planet. The challenge of feeding nine billion people without further deforestation and environmental degradation has resurrected the specter of Malthusian limits to our planet’s ecological carrying capacity. These limits are expressed in food and water shortages, forced migrations, political instability, armed conflict, abatement and cleanup activities, and health care related to pollution and climate change. Even with the powerful tools of food crop bioscience–marker-assisted selection, targeted mutation-selection, genetic modification, and others–maintaining crop production levels at expected higher temperatures and with less water is highly questionable. Precise genomic editing of cereal grains could equip rice, wheat, and corn with nitrogen fixation capabilities, thus reducing the need for synthetic fertilizers with their environmental and atmospheric costs. East and South Asia, facing major food production challenges, ecological limits, pollution from fertilizer use, and drought from climate change, may take the lead over the West in adopting innovative food crop technologies. Meanwhile, hundreds of thousands of human beings of many ethnicities have had their genomes decoded over the past decade, with the number expected to increase exponentially as sequencing technologies grow in productivity and decline in price. Genomic information coupled with precise genomic editing and bioregenerative tools give us unprecedented power to shape the course of evolution, including our own. William Hoffman is a writer in the Department of Laboratory Medicine and Pathology at the University of Minnesota. He is coauthor with Leo Furcht of "The Biologist’s Imagination: Innovation in the Biosciences" (Oxford University Press, 2014), "The Stem Cell Dilemma" (Arcade Publishing, 2008, 2011), and “Divergence, Convergence, and Innovation: East-West Bioscience in an Anxious Age,” Asian Biotechnology and Development Review 16:3 (November 2014). 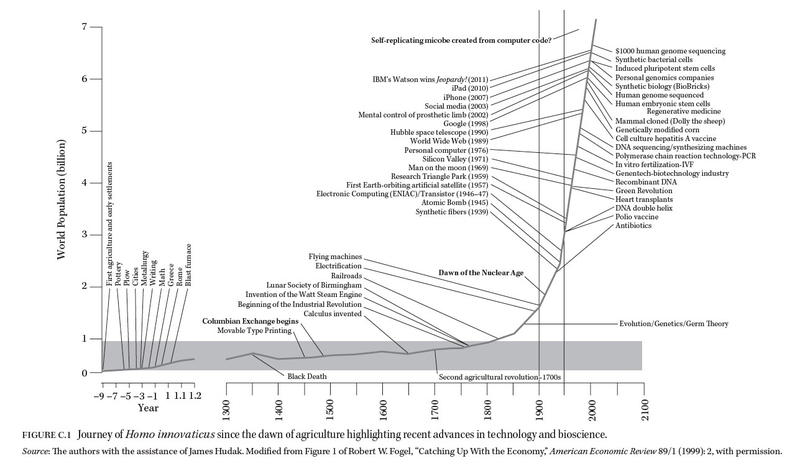 Hoffman is also author of “The Shifting Currents of Bioscience Innovation,” Global Policy 5:1 (February 2014). 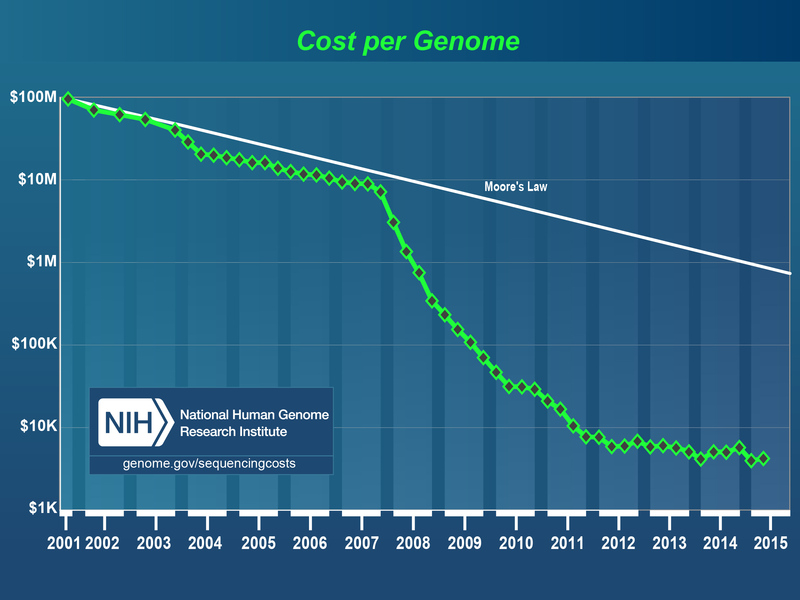 Cost trend of sequencing a human-sized genome and Moore’s Law 2001 – 2015. Source: Kris A. Wetterstrand, DNA Sequencing Costs: Data from the NHGRI Genome Sequencing Program. The practice of technological innovation in the industrial era – the systematic application of ideas, inventions and technology to markets, trade, and social systems–is now being joined with the code of life, DNA, and the basic unit of life, the cell. Even as the economic gap between East and West narrows, no other convergence has such profound implications for our future and the future health of living systems and ecosystems. That makes the task for policymakers a daunting one.